Puno is a city in southeastern Peru, located on the shore of Lake Titicaca. It is known as the folkloric capital of Peru due to its wealth of artistic and cultural expressions, particularly dance. Valicha is a well known huayno from Cuzco. It was composed by Miguel Angel Hurtado in honor of Valicha Willca, a very beautiful Incan woman. The Inca civilization, which flourished for hundreds of years and left behind priceless archeological artifacts, will be revived in Seoul. Click the figure below to view: "The Great Myth and Mystery of Peruvian Civilization." and explore Korea, Seoul interactive map. Take advantage of the pan and zoom bars to go to Machu Picchu placemark. The Santa Giulia Museum in Brescia will be exploring Inca secrets in the new exhibition entitled “Inca in Brescia: Live the Legend - Origin and Mysteries of the Golden Civilization”, which runs from 4th December to June 27th next year. Click the figure below to view: Inca in Brescia: Live the Legend. Click the figure below to view: Quechua, Andean nations seek revival for ancient Inca tongue. Pre-Columbian is used especially often in the context of the great indigenous civilizations of the Americas, such as those of Mesoamerica (the Olmec, the Toltec, the Teotihuacano, the Zapotec, the Mixtec, the Aztec, and the Maya) and the Andes (Inca, Moche, Chibcha, Cañaris). Explore Lima, Peru through detailed Google satellite imagery. Click the figure below to read more about Jorge Chavez International Airport, Lima, Peru. Killke and Killke-Related Pottery from Cuzco, Peru, in the Field Museum of Natural History by Brian S. Bauer and Charles Stanish. Click the figure below to see the interactive mind map about the Killke Pottery. 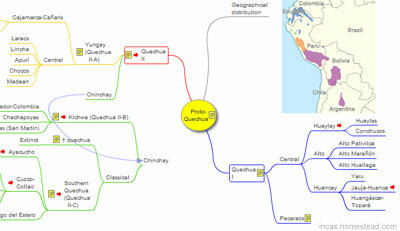 Quipus or khipus were recording devices used in the Inca Empire and its predecessor societies in the Andean region. Khipu is the word for "knot" in Cusco Quechua, the native Inca language. Click the figure below to see the interactive mind map based on the Khipu Database Project by Gary Urton and Carrie Brezine. The Inti Raymi ("Festival of the Sun") was a religious ceremony of the Inca Empire in honor of the god Inti. Click the figure below to view Tomb shows Peru’s Moche were Christ’s contemporaries. The Quipu was a system of knotted cords used by the Incas and its predecessor societies in the Andean region to store massive amounts of information important to their culture and civilization. Click the figure below to see The The Quipus - Index. Click the figure below to see The Quipus and The Royal Commentaries of the Inca, 1609 by Garcilaso de la Vega. Click the figure below to see The Quipus: Illustrations from 1615 by Felipe Guaman Poma de Ayala. Click the figure below to see The Quipus, Recording Device. Click the figure below to see Caral: the Oldest Quipu. Click the figure below to see the Quipus and Hiram Bingham, the American Explorer who found Machu Picchu in 1911. Click the figure below to see a video about the Quipus. The Quipucamayocs, the accountants of the Inca Empire. Quipucamayocs, the accountants of the Inca Empire created and deciphered the quipu knots. Click the figure below to see The Quipucamayocs. The Royal Commentaries contained two parts: the first about Inca life, and the second about the Spanish conquest of Peru, published in 1617. A word cloud is a weighted list in visual design. Click the figure below to see the most popular words in Royal commentaries.